The launch of MG’s Z-cars in 2001 was a marketing masterstroke. Proof that you can make a silk purse out of a sow’s ear, after all, let alone polish a… anyway, we digress. Straight off the back of the BMW sell-off that arguably sent MG Rover into its final tailspin, the Z-cars were a form of life support. Developed on an extremely limited budget, with design led by renowned stylist Peter Stevens and chassis refinements courtesy of MG’s own engineers, the Rover 25-based ZR, 45-based ZS and 75-based ZT gave MG Rover a whole new attitude. If you were prepared to cast aside your prejudices about flaky interior plastics and dated exterior design, the Z-cars were all terrific handling vehicles, the mid-size ZS in particular. But it was the ZR that was the biggest seller. Marketed fiercely towards younger drivers, the ZR was a surprising sales success, taking over from the Citroen Saxo VTR as the car of choice for bright young things in rearward-facing baseball caps. Part of the ZR’s appeal was that, no matter which one you went for, they all looked pretty much the same. As a result, the 1.4-litre ZR 105 with its 103bhp K-series engine (still more powerful than most comparable 1.4s of the era) was no less endowed on the exterior than the VVC-engined 1.8 160. A bold colour pallet – Trophy Blue, Trophy Yellow, Solar Red, Le Mans Green and X-Power Grey - added further to the ZR’s visual impact. As new cars, they were keenly priced, too, especially with some of the subsidised insurance offers that MG put together to entice younger drivers into the brand. In marketing terms, it was a valiant effort. The ZR was, for three years, MG Rover’s best-selling model, outselling the traditional Rover 25 and 45 models, but with a greater ratio of private rather than fleet sales. With all the R&D paid for many moons ago, it was bringing in much needed cash to MG Rover’s depleted coffers – ultimately, too little, too late, but you can’t fault the effort. Today, the ZR is – to many – a cast aside banger. Old-fashioned, slightly chavvy, and a faded parody of its former self. But to others, it’s a car steeped in nostalgia. There are many people in their Thirties with happy memories of a ZR, and very soon there’ll be more of them who want one than there are good ones left. Especially as they’re prone to underbody corrosion and head gasket failure, as well as owner neglect. Find a good, unmodified one and put it away somewhere. You could be sitting on the Peugeot 205 GTI of the 21st century. Totally agreed, but finding a unmolested and cared for example will be the challenge. But another derivative of the 200/25 that needs a mention is the often forgotten Rover streetwise, quirky looks that were ahead if it's time probably paving the way of the endless faux off roaders on the streets today. The same rule applies to the streetwise as the MG's, find the best example and squirrel it away as I'm sure they will have a following in time. 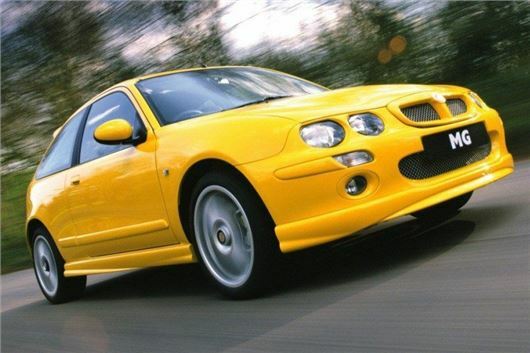 Nice to read your piece on the MG ZR, boy did we do the 'Z' cars on a limited budget. My major regret with the cars was M.D. Kevin Howe's stupid decision to save money by having the badges made in Turkey, they cost about 20p less than high quality UK sourced badges and now almost all have gone milky and faded! I cringe every time I see them and just wish I had beaten up on Howe and the board for making such a daft decision. The badge is the main selling point of any car, quality badge - quality car, it's simple. Otherwise I still think the cars were great value for money and fun to drive. People should look out for a low mileage, good condition, black Streetwise, or maybe an MG ZR van, lighter than a saloon and with rear windows fitted it makes a great little street racer or trackday car! As a proud Streetwise owner, Peter, I'd like to thank you for the work you and your team did to design such a revolutionary car on a limited budget which was clearly so far ahead of its time - it's only now it seems to be getting the praise it richly deserves. It's influence is so obvious, and I see a little bit of Streetwise design in every one of these "flavour of the month SUVs" which proliferate our city streets now, even in the 'new' MG ZS which launches tomorrow ! Having said that, most of them dwarf my little Streetwise now ! The Streetwise still attracts a lot of befuddled looks from fellow motorists, especially when they see it's 04 registered. If there was a royalty scheme similar to that which musicians have, you and your team should be coining it in from the modern day Streetwise equivalents !